With Friday the deadline for connections to secure slots in the 2018 Pegasus World Cup Invitational, shuffling went down to the wire for spots in the $16 million race set for Jan. 27 at Gulfstream Park. As many as 12 will head postward in the second running, with slots priced at $1 million apiece. The Stronach Group, Gulfstream's operator, has supplemented the purse and guaranteed a $650,000 return for all runners regardless of finish. Here's our latest look at the field (in alphabetical order). Collected — The second-place Breeders’ Cup Classic finisher is back on the work tab as of Dec. 2, and he’s had success shipping to run outside of Bob Baffert’s base in California. Back in 2016, at age 3, Collected won stakes at Sunland Park and Keeneland. Gunnevera — Connections are treating the Pegasus like their home game, with three of the colt's five career races at Gulfstream. They opted to skip the Grade 3, $100,000 Harlan's Holiday as a prep upon obtaining a slot to run in the world's richest race. Gun Runner — In typical fashion for this one, he hasn’t missed a beat coming out of the Breeders’ Cup Classic. The Pegasus will mark Gun Runner's career finale before standing at stud at Three Chimneys Farm. Despite the depth of this field, he’ll be a heavy Pegasus favorite. Seeking the Soul — He stepped up from a record allowance win at Keeneland to take the Grade 1 Clark Handicap at Churchill Downs. Trained by Dallas Stewart and owned by Charles Fipke, he is, as of Dec. 15, getting priority to run in the Pegasus over stablemate Forever Unbridled. Toast of New York — After an unsuccessful stud career, the 2014 Breeders' Cup Classic runner-up won his return race after 1,130 days away. Trainer Jamie Osborne called the Pegasus a "dream scenario" for the lightly raced 6-year-old, and connections confirmed the next week he's a go. Game Over or War Story — Both are owned by Loooch Racing, who has a slot for the Pegasus after War Story ran fourth in the inaugural running. Last out he was fourth in the Breeders' Cup Classic. Game over is a stakes placed 3-year-old last seen running fourth in the Grade 1 Pennsylvania Derby. Stellar Wind — Thought to head straight to the breeding shed after sold for $6 million at the Keeneland November sale, she returned to the work tab Dec. 3, now in trainer Chad Brown’s care. New owner Coolmore has a slot, and Stellar Wind is so far their pick for the Pegasus before she mates with American Pharoah. But Stellar Wind hasn't drilled since her first work back. West Coast — Third in the Classic, his first try against older horses, this one still hasn’t likely peaked after looking like the best of his crop the second half of 2017. Wins include the Grade 1 Travers and Pennsylvania Derby. He returned to the work tab on Dec. 7. Destin — Trainer Todd Pletcher entered the son of Giant's Causeway in the Harlan's Holiday following an off-the-board finish in the Grade 1 Clark Handicap. "Maybe a good performance in there could put him in the mix for the Pegasus," Pletcher said. Well, Destin ran fourth, and it didn't look like a bit more distance would help. Fear the Cowboy — The Harlan's Holiday winner, meanwhile, swept past the field with a strong move through the turn and won his third straight race at Gulfstream. "We are open to probably taking a chance, because on this track he runs well," said trainer Efren Loza Jr.
Prime Attraction — Scratched from a Thanksgiving weekend turf stakes at Del Mar, Prime Attraction instead went in the Grade 3 Native Diver on the main track, with the win impressive enough to owner Deron Pearson that he’ll consider the Pegasus. Connections would have to “partner up” for a slot with an existing owner who isn’t fielding a horse in this year’s race. He next worked out Dec. 9. Sharp Azteca — Trainer Jorge Navarro said the newly minted Grade 1 winner, who took the Dec. 2 Cigar Mile, is “95 percent” a go for the Pegasus. He would travel a furlong farther next out but figures to be up near the early lead with Gun Runner. But as of now, connections haven't purchased a slot. Giuseppe the Great — Grade 1 placed, he won an entry-level allowance Dec. 10 at Gulfstream that had trainer Nick Zito thinking big. Zito said it would take a deal with a stakeholder, so owner Nine Moss isn't all in for the $1 million. But, Zito says, "She has a great quote: 'If you don’t take the shot, you can’t score.'" Mind Your Biscuits — He’s perhaps the longest shot of any possibles right now to try the Pegasus, but trainer Chad Summers made mention of it after a second-place effort in the Cigar Mile. “I’d say 15 percent looking at the Pegasus” was how Summers put it, but a lower-class option at a shorter distance seems more likely. Forever Unbridled — Fipke, her owner, wasn’t joking in the Breeders’ Cup Distaff winner’s circle about going to the Pegasus with this lightly raced mare, with three starts in a year — all Grade 1 wins. But it appears Dallas Stewart stablemate Seeking the Soul will get to run in this spot instead. Neolithic — Removed from Cigar Mile consideration, he was then pointed to the Dec. 16 Harlan's Holiday at Gulfstream. But the Todd Pletcher trainee was subsequently retired. 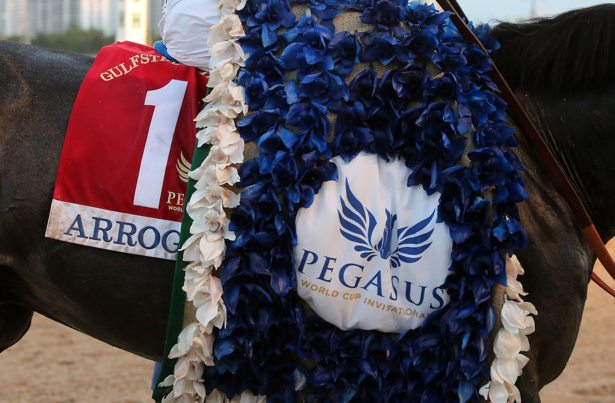 While he didn't win a graded stakes, the horse did finish third in the inaugural Pegasus. Shaman Ghost — If Gulfstream Park track owner Frank Stronach had wished to field an entry in the Pegasus, this could have been the contender. But trainer Jimmy Jerkens confirmed the dual Grade 1 winner has retired after Stronach's announcement that Shaman Ghost will stand at stud in California. He previously returned to training following throat surgery.